As well as being capital of its province, Bari is also the capital of Puglia itself. With a population of over 350,000, it is famous for its university and its port and is the second most important economic centre in southern Italy. A heady mix of cultures including Arab and Roman, it is also where Saint Nicholas, of Father Christmas fame, was laid to rest! The historic centre of Bari lies in the north on the peninsula between two modern harbours. It’s separated from the new part by the Corso Vittorio Emanuele II with the Piccinni Theatre – the corso is a popular place for the evening passeggiata. In the labyrinthine old town you can visit the Basilica di San Nicola (the aforementioned Saint Nicholas) as well as Federico II’s Castello Svevo and the Romanesque cathedral. A little north of Bari, visit the 18th-century Museo Jatta di Ruvo (located in Ruvo di Puglia, piazza Bovio). This has a fascinating ceramics collection and its gardens are a refreshing escape from the summer heat. The major shopping area is in the modern southern part of Bari, the Murattiano on via Sparano and via Argiro. If you tire of shopping (!) take a walk along the promenade. Bari airport is named Karol Wojtyla Airport after Pope John Paul II and has many international flights. You may well take one of your flights to or from Puglia here. 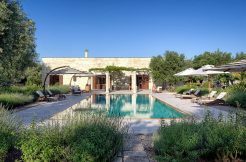 It is about two hours from the luxury masseria rental villa.